Still trying to work out where on my site I should put details of this, but in the meantime the years of waiting for an authorative book on UFO are over! 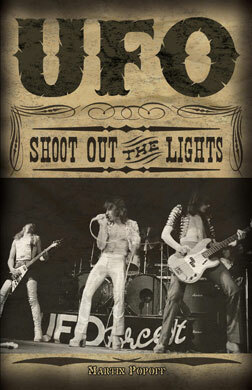 "UFO - Shoot Out The Lights" is a compilation by Martin Popoff of years and years worth of interviews, including many previously unpublished ones. The book starts at the very beginning with UFO1 and goes right up to the present day. Although not technically a history of the band, it gives a real insight into the bands development and contains many hilarious anecdotes amongst the 257 pages, as you'd expect. I would definately reccommend it to any fan of the band. Many thanks to Martin for the review copy!